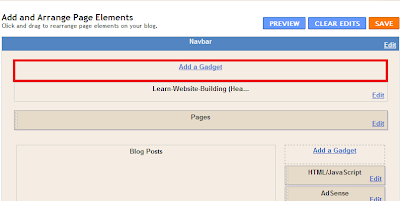 Have you ever wanted to add more page elements ( Widgets ) to your template. You can do this for sidebar and footer of you template but there is no such direct way to add more page elements to the blogger template header. So this is what we will learn today. This is how the design tab looks before doing this tweak. And this is how it will look after adding additional widgets bar up in the header. This requires few steps to be followed and is pretty easy to do. You just need to carry out few tweaks in you Edit HTML section. In some old blogger days the "maxwidgets" was used to be written as "maxelements"
Now you need to change the ( 1 ) to what ever number of widgets you like in the header. For the time being choose 3.